The First Samoans Project Complete! Archaeological and geological research was conducted along the southeast coast of ‘Upolu Island, Sāmoa over three short field seasons in 2013 and 2014. 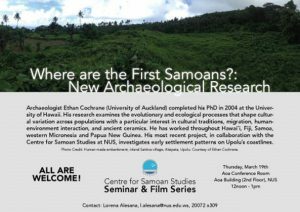 The goal of the research was to answer the question: where are the earliest Sāmoan settlements? The current earliest settlement is located at Mulifanua and is dated to about 750 BC, near the time that Tonga was first colonised by ancient sailors and perhaps 200 years after Fiji was first colonised. These earliest sites in Samoa, Tonga and Fiji all have a distinctive form of highly decorated pottery called Lapita. While, both Fiji and Tonga have many archaeological sites with Lapita pottery dating to about 950-750 BC, only the Mulifanua site in Sāmoa has Lapita pottery and is this old. 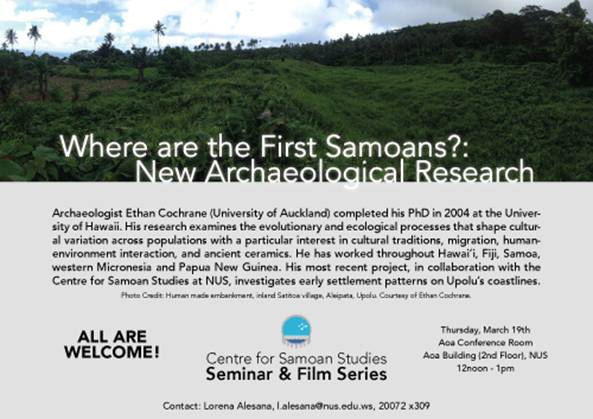 A key question for archaeologists is ‘are there more Lapita sites in Sāmoa that are as old as Mulifanua?’ Answering this question is complicated by the fact that the coastlines of ‘Upolu Island have been submerged over the last three thousand years by changes in sea-level and by the geological “sinking” of the island, drawn down by the weight of Savai‘i. Therefore the areas where ancient Sāmoans may have settled at 750 BC may now be offshore and underwater, or buried under metres of sediment. Previous research by geologists indicates that the coastlines of eastern ‘Upolu may have been the least affected by island sinking. Therefore, the research reported here explored this area for 750 BC archaeological sites. Four archaeological excavations, each 2 x 1 metres in area, and 59 hand-driven auger cores examined the underground deposits along the coastal plain between Lalomanu and Malaelā villages. The geological results indicate that this coastal plain likely did not exist until about AD 800. Before this the area would have been a rocky coast with few or no beaches. After AD 800 relative sea-level retreated and a reef sand beach was exposed. This beach grew toward the current shoreline over time. The earliest human presence in the area occurs around AD 1400, evidenced by a fire hearth built upon the reef-sand beach, associated artefacts and microscopic plant fossils. The artefact assemblage is small and includes three pottery sherds, a small shell fishhook, broken stone adzes, and stone debris from tool-making. There are also food remains including faisua and other shellfish eaten by Sāmoans, fish such as wrasse and tuna, sharks or rays, and pig. Microscopic plant fossils identified in the archaeological layers show that after humans arrived in the area parts of the forest were burned, likely for plantations, and there was an increase in plants that grow in disturbed forests. O suesuega i mataupu tau Talaeli ma Agnuu Tuufaasolo a Samoa faapea le suesuega i le mataupu tau le Eleele, sa faatinoina lea i Aleipata i le itu i sasae o Upolu, i le tausaga 2013 – 2014. O le manulauti o nei suesuega ina ia mafai ona tali le fesili; Pe o fea tonu le vaega o le atunuu na uluai nofoia e tagata Samoa? E 4 lua sa eli i Satitoa i Aleipata, ma pe tusa ma le lua mita le umi, ae tasi le mita le lautele (2×1), le telē o le vaega na eli. Sa faaaogaina foi le masini faapitoa (hand – driven auger) mo lenei galuega, e eli ai ni pu e 59 i le talafatai o Aleipata mai le afioaga o Lalomanu i Malaela. O le taunuuga o lea elieliga/suesuega ua faalia ai, e lei iai se matafaga i lea vaega o le atunuu talu mai le 800TA sa na o le papa maa sa iai i le talafatai i lea vaega o Samoa. O lona uiga i tua atu o le 800TA na faatoa iai le matafaga mai oneone o le aau seia oo lava ina olaola pea e oo mai i le taimi nei. O le vaitau na uluai nofoia ai e tagata lea vaega o le atunuu pe tusa ma le 1400TA. O le pinefaamau o lea mau o tainafi sa maua i lenei elieliga/suesuega, o atigi figota, mātau, to’ima’a, o nutigāma’a sa fai ai aupega i aso anamua. Sa maua ai foi atigi faisua ma atigi figota, o ivi ia ma ivi o moa ma puaa. Na māua foi i lenei suesuega ina ua uluai nofoia e tagata lenei ogaeleele na agai loa e fa’ato’a, susunu ma toto ai la’au ua mafua ai ona afaina le eleele lelei sa iai muamua. E lei iai se nofoaga o Samoa ua umi ma leva ona nofoia e pei o Mulifanua ua faamauina i lenei suesuega, e faailoa mai ai le faitauaofai o tagata sa nofoia lenei eleele pe tusa ma le 800 tausaga talu ai Ua mafua lea tulaga ona o le leai ose nofoaga maualalo i le va o Lalomanu ma Malaela e faigofie ona nofoia e tagata. E oo foi i lena vaitau, e lei toe nofoia e tagata lenei ogaeleele tusa ma le 600 tausaga talu ai.